I did a little gardening last year (and by gardening I mean I grew things in containers). My husband and I have talked for years about putting in an actual garden in our large backyard. Food for us and less lawn to mow, bonus! We decided that this year would be the year we actually get things accomplished. Confession: I don’t really know what I am doing. I google and Pinterest creep and do a lot of reading but for me the best way I learn is just to jump in and get my hands dirty. My husband is a pretty handy guy so for any of the actual building of things, I just tell him my ideas and he tinkers until he makes something work. For anybody curious, I live in the suburban Detroit area which according to the USDA is Zone 6a. I live in an area where most people have small yards but I happen to live on a 1/4 acre. We have massive problems with squirrels and rabbits in our particular neighborhood, along with raccoons, possums and the occasional feral cat. Between all those critters, they typically dig up or eat anything I have ever set in the ground. 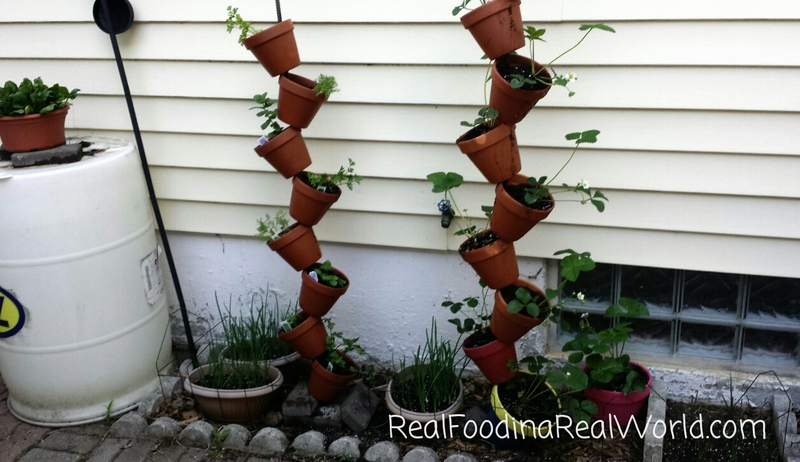 I have been trying to grow strawberries without much success. This year I decided to try a completely different approach. I had seen a picture of a “tipsy pot” in my random googling and decided to try it out. Just like I can’t follow a recipe, I can’t follow instructions so I changed mostly everything. We bought 10ft sections of half inch rebar and pounded them about 4 feet down in the ground. Then I was able to stack 10 6-inch clay pots tipped in opposite directions. I have one for strawberries and one for herbs. I am cautiously optimistic! Surrounding the tipped pots are onions. We are growing about 75 sets of green onions and 10 or so white bulbs. In this area is also my handy baby spinach bowl, I can just collect enough for a smoothie or salad and it will keep growing! For our major garden area we knew we needed major protection from the bunnies. I have a dog which helps a little bit but they are pretty brazen bunnies. We decided to go with raised beds as our first layer of protection. The big beds are 6ft by 4ft and made with cedar planks. The posts are 4×4’s cut down to 2 ft sections and sunk down about 14 inches. There is a smaller squash bed made with the leftover sections, about 3ft x 2ft. I made a grid to follow square foot gardening guidelines and the beds are filled with a mixture of soil, compost/manure and peat moss. We have tossed every worm we can find into the beds as well! 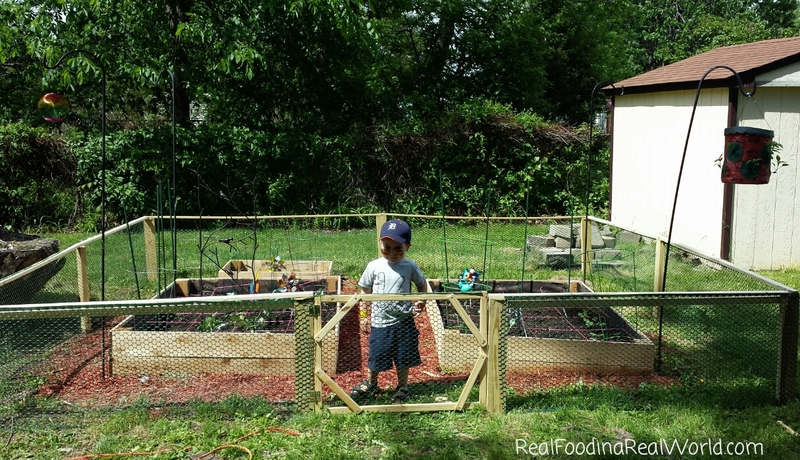 Mr. Real Food also built a fence surrounding the garden. 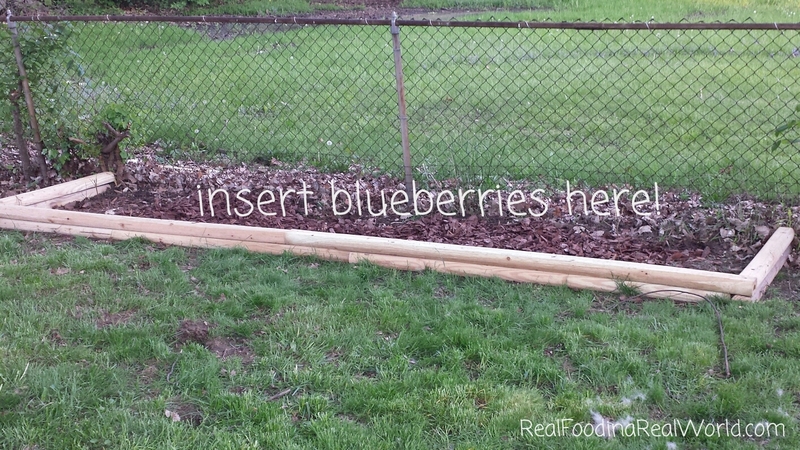 It is basically sunken 2×4’s, poultry fence and 1×2 strips. He cobbled together a gate out of the leftovers that perfectly fits my garden cart. We covered all the pathways with mulch to cut down on weeds. I have some shepherd hooks for hanging baskets as well. I am feeling excited about the prospect of actually producing food this year! We have a few more things we would like to add so I will keep updating as the summer progresses! 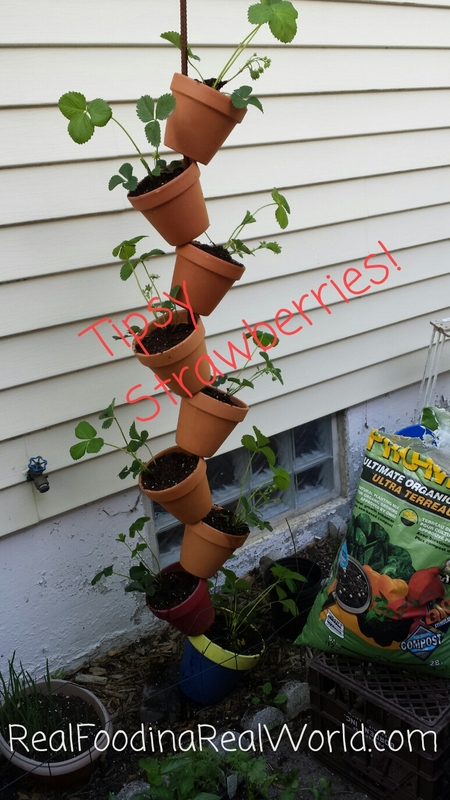 I really like your strawberry tipsy tower idea. I am gathering inspiration to design my garden for next year. I presume you have used the plant pot’s drainage hole to thread the pots together? Yep, they fit perfectly through the rebar! Thanks for stopping by my corner of the internet! Love your garden! Keep up the good work! Thank you so much! I have an update I keep trying to finish!